Motion Capture is a technique and term used for centuries that we all have probably seen without noticing it. The first interest for this technique was to study and examine the movement of humans and animals. After the 19th century Hollywood decided to experiment with it. This method also known as “Performance-capture”, is used in many animation movies which are now blockbusters. This technique as shown by the picture below can be produced with people wearing a Lycra suit with sort of ping pong balls attached to the suit which are then detected by a computer to record the movements of the body and create an animated video with the combination of the movements. 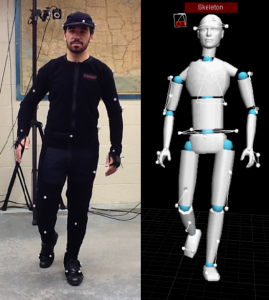 Motion-capture in the late 20th century has been used in various fields such as sports, bio-mechanics, education and also video games such as the Prince of Persia. to cartoon animation) to frame the movement of the actors and associated to a cartoon character a method of movement. Fleischer was then followed by Disney, whom using live-action reference created Snow White and the Seven Dwarfs, by filming the actors in a normal scene and afterwards translating it to animated motions. After this sort of experiment that went relatively well, Disney produced famous animations such as Alice in the Wonderland, Sleeping Beauty and Peter Pan. After the production of Sleeping Beauty, motion-capture slowed down for several decades, until finally Ralph Bakshi, in 1978, used rotoscoping for the animation process of Lord of the Rings, which should have had better promotion and rates!! I mean come on! It is one of the greatest animated movies of all times!! The one movie which used a lot of motion-capture technique is the famous Dawn of the Planet of the Apes, followed by Star Wars the 7th episode and Avengers 2. To know more about a specific animation PLEASE do read the other articles!